4G Coverage in New York City - Will It Be Sprint, Verizon, or AT&T? 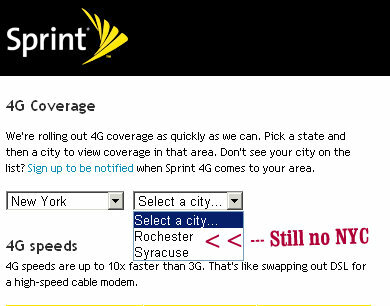 4G Coverage in New York City – Will It Be Sprint, Verizon, or AT&T? Sprint says they are testing 4G coverage in New York City, and people are even reporting occasional 4G connections throughout Manhattan. But the biggest question is this – who will be the first carrier to actually deliver 4G to The Big Apple? New York City is a huge market with millions of mobile data customers. From the iPhone, iPad, and now the emerging Android tablets, NYC is sure to be one of the highest demand cities for 4G speed. Yet even though Sprint says they are currently testing their 4G connectivity in New York City, there are two other carriers that have remained relatively silent on the issue – and that this Verizon and AT&T. Certainly Verizon or AT&T could allocate more resources to bringing 4G to NYC. And I’m wondering if one of them, or both, are secretly working behind the scenes on bringing 4G to the New York metro area. If this is the case, then Sprint better be pushing hard right now to bring 4G online in New York, or else any day now we could see a new release from Verizon or AT&T that 4G is now online. Or better yet, we could see a 4G satellite launched that will put the United States under one big 4G cloud. Then the whole “who can bring 4G coverage to New York City” debate will be a moot point. None of which would be good for Sprint!